The Victoria Shamrocks continue to roll along, picking up their fourth straight win to start the season as they handed the visiting Coquitlam Adanacs a 14-6 loss at the Q Centre Friday. It was just Coquitlam’s second game of the season. Cody Hagedorn started between the pipes for the Shamrocks and former Shamrock Josh Phillips got the nod for the visitors. After an emotional opening faceoff involving the family of deceased West Shore RCMP Officer Sarah Beckett, the Shamrocks got on the board just 19 seconds in when team captain Corey Small scored from the dotted line. Coquitlam tied things up at 6:17 on an unassisted goal by Dean Fairall, also from well out. Victoria rattled off 4 straight to take command of the game. Matt Hamilton scored his first goal of the season and his WLA career at 6:44 with a quick stick in close. Small collected his second at 9:20 after a great penalty kill, firing from the dotted line. Mike Triola scored on the power play at 11:12 and added another at 13:11 from just inside the dotted line. That was the end of Phillips’ night as he was replaced by Dan Lewis in the Adanacs’ net. Coquitlam did reply with a goal from Randy Jones with the teams playing 4-on-4 at 13:41 but Small got his hat trick marker at 16:41 on the power play on a bit of an overhand blooper rather than a bullet. Shots on goal favoured Victoria by a 20-11 margin and they were up 6-2 after the first 20 minutes. Victoria got the first pair and the last two of the middle frame with a lone Adanacs goal the meat in that sandwich. First it was Cody Nass tallying when the period was just 30 seconds old with a hard low shot from outside the dotted line. Jr. ‘A’ Shamrocks call-up Cole Pickup, playing in his second straight game tallied at 1:42, going to the net. A Coquitlam power play goal from Vinny Ricci at 5:12 was the only shot that would beat Hagedorn in the period, off a rebound in close. Hamilton picked up his second for the Rocks at 11:37 in close and Pickup got his second at 18:49, fighting off a check in front to get to the net. Adanacs held the edge in shots on goal 16-12 but the Shamrocks had increased their lead to 10-3. At the 1:44 mark, Cody Cook took over in goal for Hagedorn while he had an equipment adjustment made but Hagedorn returned at 3:10. It was the home team again opening the scoring in the final period, Pickup making it a hat trick at 4:32 with a quick stick inside the dotted line. That goal came with the man advantage and he added to his total with a fourth tally at 8:29 with a bouncer from outside the dotted line. Coquitlam got one back at 9:55, Fairall getting his second of the game from outside the dotted line. With the game well in control, Hagedorn got a rest and Cook finished the game for the Shamrocks. Hamilton picked up his hat trick goal at 11:24 but off the ensuing faceoff Fairall collected his hat trick goal for the visitors at 11:31 and at 12:19 Hamilton added his fourth with a quick shot from outside the dotted line. The visitors picked up a late power play goal, Matthew Delmonico scoring at 18:13 but it was too little too late as the Adanacs fall to 0-2 on the season. Corey Small, Cole Pickup and Matt Hamilton swept the three stars as Small led the Shamrocks offense with 3 goals and 7 assists for a 10-point night. Pickup and Hamilton, former junior Shamrocks teammates, each chipped in 4 goals with 3 and 1 assist respectively. Mike Triolo scored twice and added 3 helpers and CodyNass had the other Victoria goal and added 3 assists. Cody Hagedorn had another strong performance in goal, stopping 29 of the 33 shots he faced after a 45-save performance the previous night and Cody Cook stepped in to help out. Dean Fairall was the only Adanac to score more than once, finishing with the hat trick and a helper. In the other Friday game, Burnaby defeated Nanaimo 9-8. Victoria leads the standings with a 4-0 record for 8 points with Burnaby and Maple Ridge tied with 4 points and holding a game in hand over the Shamrocks. Coquitlam and Langley are both looking for their first wins of the season. 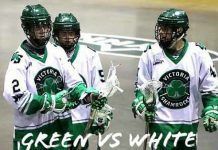 Next weekend sees the Shamrocks playing a pair of road games as they will tackle the Coquitlam Adanacs in a return match Saturday on the mainland and face the Maple Ridge Burrards on Sunday before returning to the Q Centre in two weeks, on June 16 when they will host the New Westminster Salmonbellies in a 7:30 start.